Phillip is from the southern town of Rockingham in the great state of North Carolina. Before graduating high school, he studied music during the summers at Mars Hill College and at UNC Chapel Hill. After graduating from high school Phillip studied at East Carolina University in Greenville, NC. There he earned a Bachelor of Music degree in Church Music with concentrations in choral and orchestral conducting. His principal instrument was voice and he double minored in organ and piano. After graduating college, Phillip studied at The Southern Baptist Theological Seminary in Louisville, KY. There he earned a Master of Church Music degree in voice with a concentration in conducting and elective studies in Youth Ministry. During his time at SBTS, Phillip spent a semester in NY at the Julliard School of Music and a semester abroad teaching music in Hong Kong, China and South Korea. Phillip began his ministry working in churches in 1977 at the age of 15. 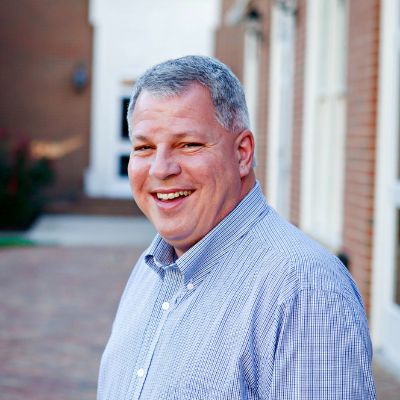 He continually served on a church staff throughout high school, college and seminary before coming to HRBC in February of 1992 where he continues today. He was originally called to HRBC to be the Music and Youth Minister until both programs grew to the necessity of splitting into two positions. Then Phillip became the Music and Worship Minister and the church hired a new Youth Minister. Phillip came to HRBC as a single young man and there met his wife Lisa. They were married in June of 1993. They have two wonderful, talented and fun children, ‘Lissa and Brandon Brown. The Brown’s completed their family by adopting a highly energetic rescue Miniature Pinscher named Sophie. Phillip loves to travel internationally and loves to spend time at Lake Gaston, NC/VA and at Garden City Beach, SC. Phillip enjoys composing music and cooking. Phillip says his greatest asset is his family and he gives God the glory for his salvation and for His many blessings.